The 2013 Phillies barely resembled the same team as the previous season on Opening Day. They had a different Opening Day starter (Cole Hamels) and only two players were on the Opening Day lineups from 2012 and 2013 (Rollins and Mayberry). What began with a sliver of excitement ended with major concerns. The Phillies are 2 games under .500 and if it weren't for the Mets and Marlins, the Phillies would be 5-14 right now. There are plenty of reasons for this, but one number sticks in my mind: 1-5. That is the Phillies' record in games in which Cole Hamels has pitched. Hamels gets a pass on a couple of these outings, but a 6-9 record was unacceptable for Cliff Lee last year and a 1-5 record is unacceptable now for Cole Hamels. Low run support might be a valid excuse for Kyle Kendrick or John Lannan, but not for the recently anointed Phillies staff ace. That title of staff ace was bestowed upon Hamels more for signing a big contract than for his performance on the mound. As soon as he signed Colbert Michael Hamels on the dotted line of a $144 million contract he became the Phillies ace, vaulting right over Cliff Lee in the process. What is the identity of the Phillies offense? Last night might have been the most complete offensive effort all season for the Phillies. While 10 hits and 6 runs is hopefully a sign of things to come, it has not been a common occurrence for the 12th ranked Phillies offense. With 33 games in the books, we should now be at the point where their personality begins to arise. So, what is the identity of the 2013 Phillies offense? That was a fairly easy question to answer during most of the Phillies' playoff run. The Phillies would score in bunches, hit a lot of home runs, strike out frequently, and struggle with fundamental hitting. The identity of the current offense is more difficult to pinpoint. With a couple completely new additions (Michael Young & Ben Revere), a young outfielder (Domonic Brown), and two aging stars with injury issues (Howard and Utley), it was going to take time for the offense to take shape. Last night was game number 33 of the Phillies season and they have now completed one-fifth of the season - that should be enough to give us a pretty clear picture of the hitting unit. And the personality of this team is, well, they just look...old. They aren’t great, they aren’t awful, they are just kinda there. The offense is grasping onto enough of a semblance of talent to stay out of the statistical basement, but they don’t have enough to be even considered average. Chase Utley is giving the Phillies way more than they could have imagined this season. For a guy with chronic knee problems who has missed 185 games over the past three seasons, just having him on the field is a huge success. The fact that he is hitting .271 with 7 home runs, 24 RBI, and an .823 OPS is icing on the cake. But he also has been really weird this season. Utley is a bit of an awkward dude to begin with, but his play on the field has never been weird. Utley has always been an ultra-focused player who works the count, makes great decisions, plays fairly sound defense, and runs the bases well. But not this season. Last night was a great example. With no outs in the first inning, Utley hit a double and considered going to third before throwing on the breaks...then changing his mind and getting thrown out. He broke the cardinal rule: never make the first or third out at third base. Later in the game, he had a chance to easily throw out a runner at the plate but hurried his thrown and air mailed it to Ruiz. Those are not the only two blunders of Utley's 2013 season. Jimmy Rollins scored his 1,200th run on Friday, making him the fourth player since 1921 to score at least 1,200 runs with 400 or more steals. Impressive numbers, indeed, and. . . Hall of Fame worthy?? Jimmy appeared well on his way to a place in Cooperstown after an MVP 2007 season in which he hit .296 with 30 home runs, 20 triples, 41 stolen bases, and 139 runs scored. But Rollins has not come close to replicating that season ever since and from 2009-2013 he is batting .254 with a .315 OBP. Hard to think Hall of Fame for a player with clear deficiencies in his offensive game, but remember that Rollins plays a predominantly defensive position (we'll get into that later) and in comparison to all-time shortstops, the numbers are there. Here is how Rollins' numbers stack up among shortstops all-time. The Phillies are two games away from the 50-game mark of the season and it gives us a decent sample size to start bashing constructively criticizing Ruben Amaro's 2013 moves. Ruben Amaro attempted to squeeze one last drop form the best era in Philadelphia Phillies history. Limited payroll flexibility and a barren farm system made that task a difficult one for Rub. As opposed to making high profile free agent acquisitions, he was forced to make several "low risk-high reward" moves. Let's take a look at those moves. How do Phillies compare to previous Charlie teams? The Phillies are two games under .500 this season at the 50-game mark. Since Charlie Manuel teams are notoriously slow starters, I thought it would be fun to compare the 2013 Phillies to the eight previous Charlie teams and see where they stand. If the Phils take off in the second half like they have done in every season under Charlie Manuel, as Lloyd Christmas pointed on in Dumb and Dumber, "so you're telling me there's a chance." 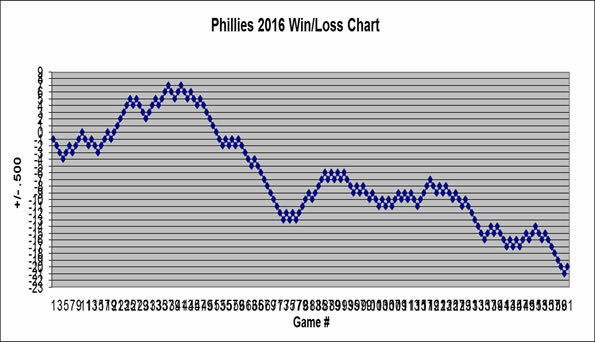 The way the Phillies records climb on the win/loss charts in the second half is nothing short or amazing. The Phillies have finished no worse than 13 games over .500 after the break and have a combined post all-star break record of 357-228 (.610). That's a 162-game pace of 98 wins per season. Angelo Cataldi can criticize Charlie Manuel all he wants, but that is the only number that matters to me. 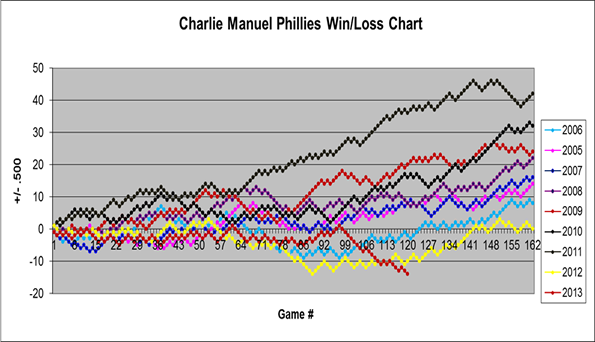 Here is the combined chart of Charlie Manuel's Phillies teams over the previous eight seasons. If there was ever a chart of managerial success, this is it. That chart says that if the Phillies can just hang with the previous clubs, Charlie will bring them home. Ryan Howard has reportedly been diagnosed with Slidis Unrecognitis Syndrome. SUS is a condition in which a baseball player is unable to recognize a slider and in serious cases removes the ability of a player to recognize the type or location of any pitch. Howard's SUS existed his entire life but remained dormant until the 2010 season. Of course I’m kidding here, but the problems with Ryan Howard are no joke - he is hitting .254 with 6 home runs, 25 RBI, 52 strikeouts, and a .719 OPS that ranks fifth on the Phillies. When Howard is not hitting home runs, he offers very little to the team. He does not hit for average, he can't run, he's a bad defender, and he strikes out too much. With an inflated contract, he might as well have an “Untradeable” sign stuck to his back. Howard has been a notoriously slow starter, but his second half hot streaks carried the Phillies for many years and contributed to unparalleled power and production numbers for the first six seasons in his career. From 2004 to 2009, he batted .279 and in a 162-game season averaged 49.1 home runs, 142 RBI, a .376 OBP, .586 slugging, and .962 OPS. It has been four years since we have seen such production from Howard. Since 2009, he has a .255 average and in 162 games averages 33.8 home runs, 121 RBI, a .335 OBP, .480 slugging, .815 OPS, and 189 strikeouts. The RBI total shows that he still produces, but take a look at the how the numbers drop.